Just one recipe, but it can make 2 delicious smoothies and cocoa ice cream. – Step 1: Heat the milk on a small heat, add the pure cocoa powder until smooth. Turn off the stove, drop a few drops of almond oil. To enter the cooler for cooling. – Step 2: Mix cocoa milk, frozen banana, peanut butter, coconut milk, date and vanilla into a high-speed grinder. – Step 3: Grind until the mixture is smooth, then chopped chocolate (to a few to decorate). Stir well. – Step 4: Pour the mixture into a glass. – Step 5: The remaining mixture is poured into the ice mold and frozen for 3-4 hours. – Step 6: Make ice cream: Cocoa milk has frozen out of the mold. Put in the highest speed grinder in 5-10s to form a snow cream mixture. 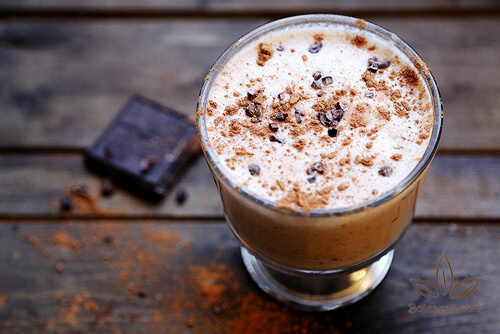 – Smoothies: Pour the mixture into glass and decorate with the remaining chocolate chips and cocoa powder. – Ice cream: Cake in the bowl and decorate with some cocoa or chocolate powder as you like. Both smoothies and ice cream are delicious, greasy with the aroma of bananas, cocoa, peanut butter. Well worth the regular dessert of your family.